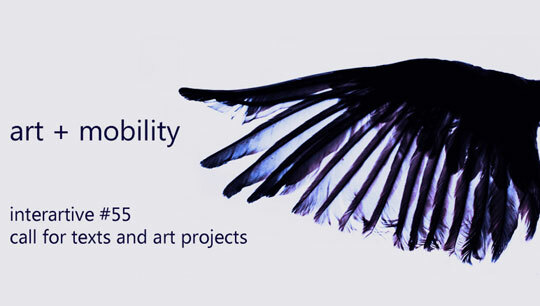 For the publication of issue #55, the digital journal InterArtive will publish a special issue dedicated to diverse aspects of the current discussion about Art & Mobility. We invite theorists, critics, curators and artists who work on the subject to participate. Artistic practices and creativity are directly and closely linked to mobility. A great part of the art and architecture that we know would not have existed if it weren’t for the urge to travel, to discover, the need to go beyond the limits – territorial and intellectual – of the known. To reflect on mobility today means to widen the perspective, to go beyond the concepts of travel, discovery and displacement; it calls for an analysis of the social, political, economic and cultural phenomena linked to it. The practice of mobility can be thought of as a phenomenological experience where identity comes into contact with alterity, as a path of transformation where ideas, perceptions and preconceptions are questioned, as a value and as a conscious process of enrichment and of knowledge, and not just as a simple trip, or a simple displacement. Mobility presents multiple facets: it is directly related to the issue of diversity, exchange, experience and intercultural dialogue. At the same time, it makes us reflect on migration, exile and the obstacles faced when crossing borders. The objectives of this call are to reflect on a history of mobility, to go in depth in the processes of transformation of knowledge, culture and art in the practice of mobility and, above all, to think about mobility today, in a contemporary context.